Mushroom burgers do seem to be one of those things that omnis warm up to more easily than some other veg meals, as is evidenced by the fact that portabello mushroom sandwiches turn up on just about every menu these days. And why not? Mushroom burgers are awesome. Be it a simple grilled portabello cap or a more complex burger recipe, mushrooms give veggie burgers a particular texture and juiciness that’s hard to find in boxed varieties. 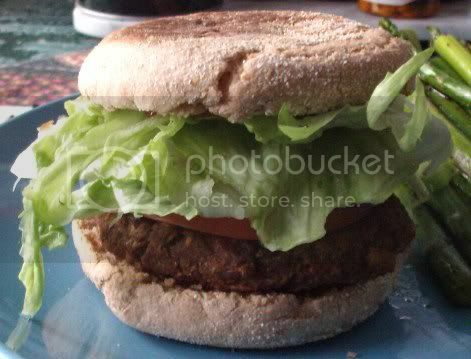 Thus, I was happy to find a very tasty-sounding mushroom burger recipe in the Happy Herbivore Cookbook! My mom loves mushroom burgers, too, so it was sort of a given that I would make these at some point. Having just procured several cans of organic pinto beans, there was no time like the present. I wound up throwing a batch together on Thursday. The only thing I didn’t have was steak sauce, so I used a little drizzle of liquid smoke instead. It made the entire kitchen smell great before I had even cooked anything! These were easy burgers to put together. 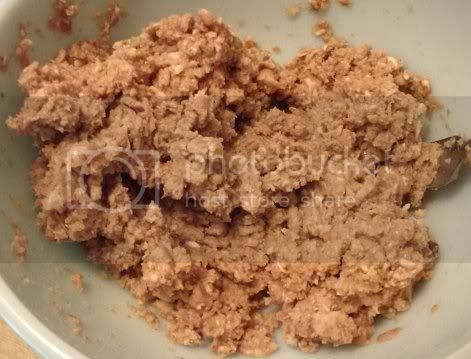 I loved the step that called for making bread crumbs by pulsing a slice of bread in the food processor. It’s one of those simple-yet-ingenious things that I wish I’d thought of myself. Chopping up the mushrooms and beans the same way brought the whole thing together pretty quickly. The final product was a bit on the squishy side, but forming patties wasn’t a problem. I opted to bake the burgers in the oven. While they were cooking, I roasted some asparagus, because my mom and I I fell in love with the balsamic asparagus the last time I made it and we couldn’t wait to have more! The final product was amazing. 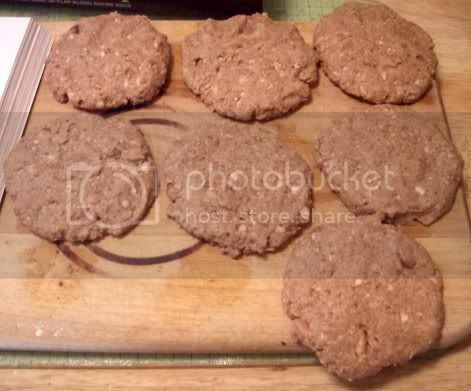 I’d never tried baking a veggie burger before, but it seems to be the perfect method for these. They came out dark and firm on the outside and juicy on the inside. 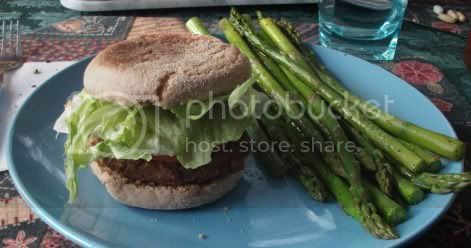 Served on a whole wheat English muffin with red onion, tomato, and lettuce…mmm. Delicious. Love this cookbook and now adding this recipe on the “to make soon list”. What else have you made from it? I am going to whip up (aka hopefully not burn down the kitchen) a tofu frittata from that book tomorrow. I love the chickpea tacos and have been wanting to try a lot of those recipes. I am a big fan of the black bean brownie recipe (though I double the cocoa and add walnuts). I’ve been wanting to try that one, but I’m allergic to bananas. I might try substituting applesauce or something similar. the mushroom burger came out so beautiful! I can’t believe that’s my recipe — it looks so professional! I’m thrilled you enjoyed them! Can I share this on Facebook? And we LOVED these, by the way. I froze the rest of the batch so we can have them for quick lunches and dinners in the future.